I confess, I have been a bit surprised at the number of people who are predicting a Sergio Martinez rubout, saying that the Argentine is going to whack Miguel Cotto around with the ugly stick, mercilessly, resulting in a stoppage win for the 39-year-old. That’s by no means a diss on Sergio…but I am mindful of the way his body has been betraying him the last few years, as it does us all if we are lucky enough to wake and soldier on another day. 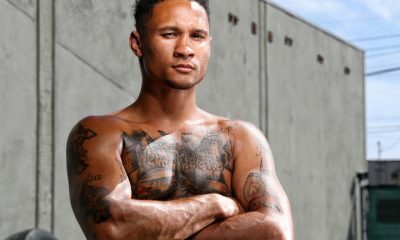 That said, when looking at the two men Friday, at the weigh in, Martinez looked a weight class larger to me, and yes, I do believe his strength edge, his size edge, could prove to be the difference-maker against a guy who I think left a measure of his power back at 140 pounds. Anyway, Sergio looked in fine form, and that doesn’t surprise me in the least, because he’s fortunate enough to have superstar chef Chris Santos, who many of you Food Net watchers know from “Chopped,” advising him on nutrition. I checked in with Santos on Monday, as we both watched Martinez get a nice lather going during a media/fan appearance at Modells in Times Sq., NYC. Santos, it seems, is a mega fight fan. Like, borderline crazed. The restarauteur, who owns The Stanton Social as well as Beauty & Essex, both in NY’s Lower East Side, got addicted to the sweet science “on my grandfathers’ knee as a kid.” He grew up in Providence, Rhode Island, and has been in NYC for twenty years now. 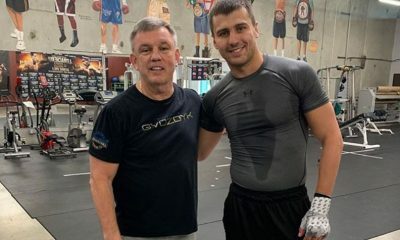 Santos, who has actually trained and sparred with pros a ton, knew grand-dad fought as a pro, and has fond memories of listening to Holmes-Cooney on the radio. 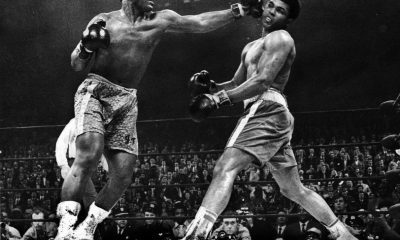 He recalls the swirl of energy in his house when Larry Holmes and Ken Norton clashed, back in 1981. His office, he told me, is “a shrine to boxing,” and he has every The Ring magazine from 1980 on, and has about a thousand fights on DVD. So, basically, you know it’s a distinct honor for him when Martinez pops in to one of his joints, and orders high-protein stuff, as he gets his body into fighting trim. Lots of egg whites, and fish, straightforward stuff for “Maravilla.” But after the fight, presumably after getting the W, steak will be sizzling. Santos told me he was going to be tracking down the best cut of beef in the city for Martinez, to chow at the after party. Sergio will chomp a massive ribeye at Beauty & Essex, Santos said. It’s clear that this guy is simply digging what he does; the cooking scene and the fight game, he said, have some similarities, in that chefs do 12 hour days, and many see that grind as being like a 12 round fight. Chef will be cheering on Sergio from the second row, camera side, on Saturday night. 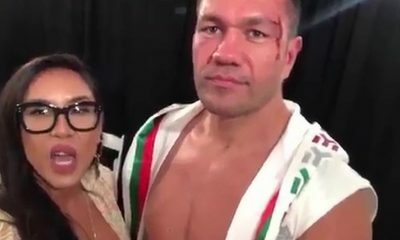 You know he’s hoping Sergio chews up Cotto, and has his mug looking something like that ribeye, medium rare, by the end of the fight. The WBC World Super Featherweight title bout between Francisco Vargas and Takashi Miura came on one of the biggest boxing stages of 2015, as the bout served as the HBO pay-per-view’s co-main event on November 21st, in support of Miguel Cotto vs Saul Alvarez. Miura entered the fight with a (29-2-2) record and he was making the fifth defense of his world title, while Vargas entered the fight with an undefeated mark of (22-0-1) in what was his first world title fight. Both men had a reputation for all-out fighting, with Miura especially earning high praise for his title defense in Mexico where he defeated Sergio Thompson in a fiercely contested battle. The fight started out hotly contested, and the intensity never let up. Vargas seemed to win the first two rounds, but by the fourth round, Miura seemed to pull ahead, scoring a knock-down and fighting with a lot of confidence. After brawling the first four rounds, Miura appeared to settle into a more technical approach. Rounds 5 and 6 saw the pendulum swing back towards Vargas, as he withstood Miura’s rush to open the fifth round and the sixth round saw both men exchanging hard punches. The big swinging continued, and though Vargas likely edged Miura in rounds 5 and 6, Vargas’ face was cut in at least two spots and Miura started to assert himself again in rounds 7 and 8. Miura was beginning to grow in confidence while it appeared that Vargas was beginning to slow down, and Miura appeared to hurt Vargas at the end of the 8th round. Vargas turned the tide again at the start of the ninth round, scoring a knock down with an uppercut and a straight right hand that took Miura’s legs and sent him to the canvas. Purely on instinct, Miura got back up and continued to fight, but Vargas was landing frequently and with force. Referee Tony Weeks stepped in to stop the fight at the halfway point of round 9 as Miura was sustaining a barrage of punches. Miura still had a minute and a half to survive if he was going to get out of the round, and it was clear that he was not going to stop fighting. A back and forth battle of wills between two world championship level fighters, Takashi Miura versus “El Bandido” Vargas wins the 2015 Fight of the Year. This coming Saturday, January 9th, the stage is set at the Baden Arena in Offenburg, Germany for a re-match between Vincent Feigenbutz and Giovanni De Carolis. 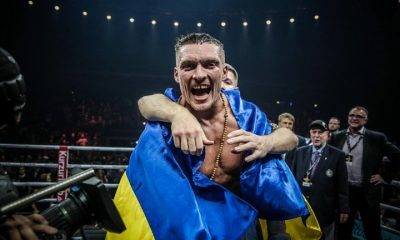 The highly anticipated re-match is set to air on SAT.1 in Germany, and Feigenbutz will once again be defending his GBU and interim WBA World titles at Super Middleweight. The first meeting between the two was less than three months ago, on October 17th and that meeting saw Feigenbutz controversially edge De Carolis on the judge’s cards by scores of (115-113, 114-113 and 115-113). De Carolis scored a flash knock down in the opening round, and he appeared to outbox Feigenbutz in the early going, but the 20 year old German champion came on in the later rounds. The first bout is described as one of the most crowd-pleasing bouts of the year in Germany, and De Carolis and many observers felt that the Italian had done enough to win. De Carolis told German language website RAN.DE that he was more prepared for the re-match, and that due to the arrogance Feigenbutz displayed in the aftermath of the first fight, he was confident that he had won over some of the audience. Though De Carolis fell short of predicting victory, he promised a re-vamped strategy tailored to what he has learned about Feigenbutz, whom he termed immature and inexperienced. The stage is set for Feigenbutz vs De Carolis 2, this Saturday January 9th in Offenburg, Germany. 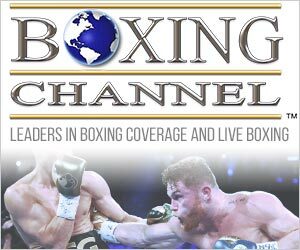 If you can get to the live event do it, if not you have SAT.1 in Germany airing the fights, and The Boxing Channel right back here for full results. On May 9th of 2015, Saul “Canelo” Alvarez delivered a resonant knock-out of James Kirkland on HBO that wins the 2015 KO of the Year. The knock-out itself came in the third round, after slightly more than two minutes of action. The end came when Alvarez delivered a single, big right hand that caught Kirkland on the jaw and left him flat on his back after spinning to the canvas.Alvarez was clearly the big star heading into the fight. The fight was telecast by HBO for free just one week after the controversial and disappointing Floyd Mayweather Jr. and Manny Pacquiao fight, and Alvarez was under pressure to deliver the type of finish that people were going to talk about. Kirkland was happy to oblige Alvarez, taking it right to Alvarez from the start. Kirkland’s aggression saw him appear to land blows that troubled the young Mexican in the early going. Alvarez played good defense, and he floored Kirkland in the first round, displaying his power and his technique in knocking down an aggressive opponent. However, Kirkland kept coming at Alvarez and the fight entered the third round with both men working hard and the feeling that the fight would not go the distance. 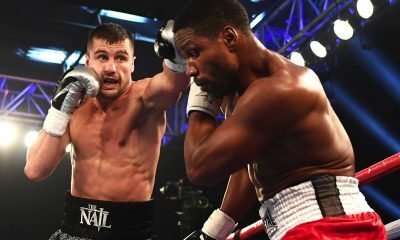 Kirkland continued to move forward, keeping “Canelo” against the ropes and scoring points with a barrage of punches while looking for an opening. At around the two minute mark, Alvarez landed an uppercut that sent Kirkland to the canvas again. Kirkland got up, but it was clear that he did not have his legs under him. Kirkland was going to try to survive the round, but Alvarez had an opportunity to close out the fight. The question was would he take it? Alvarez closed in on Kirkland, putting his opponent’s back to the ropes. Kirkland was hurt, but he was still dangerous, pawing with punches and loading up for one big shot. But it was the big shot “Canelo” threw that ended the night. Kirkland never saw it coming, as he was loading up with a huge right hand of his own. The right Alvarez threw cracked Kirkland in the jaw, and his eyes went blank. His big right hand whizzed harmlessly over the head of a ducking Alvarez, providing the momentum for the spin that left Kirkland prone on the canvas. Saul “Canelo” Alvarez went on to defeat Miguel Cotto in his second fight of 2015 and he is clearly one of boxing’s biggest stars heading into 2016. On May 9th Alvarez added another reel to his highlight film when he knocked out James Kirkland with the 2015 “Knock Out of the Year”. 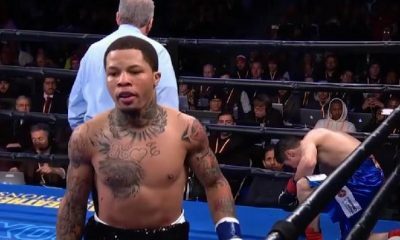 Gervonta vs. Shakur: Street Fight or Boxing? 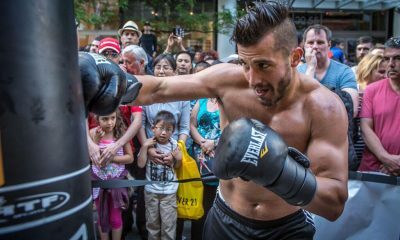 Can David Lemieux Carry His Power as he Moves Up in Weight?